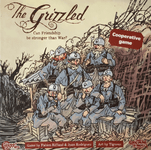 A co-operative game based on a group of Grizzled soldiers in their daily life in the trenches. Game is complete. Box and Components are well looked after and in excellent condition.